I honestly thought they’d have figured it out sometime along the way by now, that being how to get it right when barbecuing chicken. Of course I’m talking about those of my friends and family who always drag me into taking over the reins whenever it’s time to prepare the chicken as part of the barbecue, so I guess that’s why I feel it pertinent to share the secret. It’s not really a secret though and in fact half the problem they believe they have is solved through a closer look at the obvious clue, which is the fact that they leave the chicken for last. Why Leave the Chicken for Last? Chicken is a very delicate meat to have to deal with any which way you want to cook it, but when you’re preparing it over the barbecue it presents that rather unique challenge of uneven cooking. It’s very easy to appear to be burning the chicken, in which case you would then remove it from the fire, only to find that if it was any rawer on the inside it would get up and start running around. That’s exactly the reason why chicken is left for last to go on the barbecue though, but that’s just half of the riddle solved. The reason why chicken always turns out better cooked, both on the outside and all the way through when you leave it for last is because of the strength of the heat. Chicken requires very low heat to cook evenly and get that smoked taste characteristic of barbecued pieces, which is why it’s to be left for last. That is when the strength of the heat is at its lowest, but of course that does depend on how strongly the fire was built in the first place and how quickly all the other meat types to be cooked first were completed. The slower you can manage to cook your chicken on the barbecue the better. Obviously since a barbecue is typically a social event, you won’t really have the time to cook it any slower than you have to. Either way, the slower it’s cooked, the better it will come out which means the fire should be just right for it not to scorch on the outside. 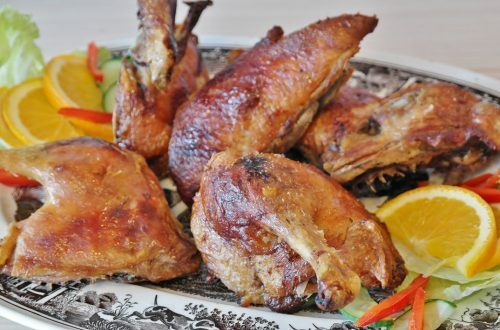 Again, this may not always make for a practical option given the nature of a barbecue, but basically what is suggests is that you’ll get better results with your BBQ chicken if it’s been marinated for as long as possible. The longer it marinates the better, ideally in a marinade that has a consistency which is close to that of regular water. It’ll perhaps have to be spiced more aggressively and regularly while it’s on the barbecue afterwards, but another trick I sometimes use to make sure BBQ chicken comes out just right is that of binding it first by partially cooking it. Simply boiling it until it becomes just a little softer will do, after which time you can throw it onto the barbecue and spice it while it cooks over the fire.